Paper Cup Making Machine is a very good option for set up a small business at home or anywhere. 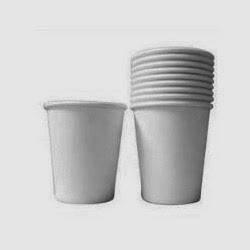 Paper Cups are generally used in coffee stalls, tea stalls, soft drinks stalls, juice stalls. Paper Cups are also used in various occasions to serve tea, coffee, juice, clod drinks etc. the demand of Paper Cups is found all throughout the year. With this Paper Cup Making Machine you can make Paper Cups of different sizes. At first you have to buy role of laminated coating paper from market. This paper is available in the market of Boithakkhana market in kolkata. The price is approximately Rs.80 per kg. now set the paper on the indicated place of the machine and start the machine. That’s all. You can make 55 Paper Cups per minute with Paper Cup Making Machine. It needs 2 hp motor and 220 to 440 volts to operate the machine. The price of the Paper Cup Making Machine (including motor) is approximately Rs. 13 lakh.